One of the easiest ways to master NCover is simply to dive into some code and improve tests, so this week we'll be looking at improving the test quality for an open source project, Json.NET, which is available on CodePlex at http://www.codeplex.com/Json. Json.NET is a tool for reading and writing JSON from .NET, and includes a JsonSerializer for easily serializing .NET objects into Json. We'll start off by compiling and running the tests for Json.NET through NCover Explorer in order to visualize code coverage, and then proceed to actually improve the quality of the test suite for Json.NET by increasing the project's code coverage. During this article we'll be using Visual Studio 2005, NUnit, and of course, NCover. If you use a tool other than Visual Studio to build your projects, you should be fine, as long as you can compile the Json.NET project. If you do not already have NUnit installed, you can simply download the latest MSI installer from http://www.nunit.org, install it, and add the NUnit bin directory to your path. NCover can be downloaded from http://www.ncover.com/download, and you'll need either a paid or trial license to complete the steps outlined in this article. Building Json.NET is fairly straightforward. Download the project's source code from the Json.NET website. We'll be working with version 1.3.1 in this article. The source is included with the 1.3.1 release, which you can download here. Once you have downloaded the code, unzip it to your hard drive and open the solution file located at Src\Newtonsoft.Json.sln in Visual Studio 2005. Building the project is as easy as clicking on Build, Build Solution within Visual Studio. After a moment you'll see some warnings show up in the Error List in Visual Studio, but the build should complete successfully. Now that the solution is finished building, let's test it in NUnit to make sure that all of the tests succeed. 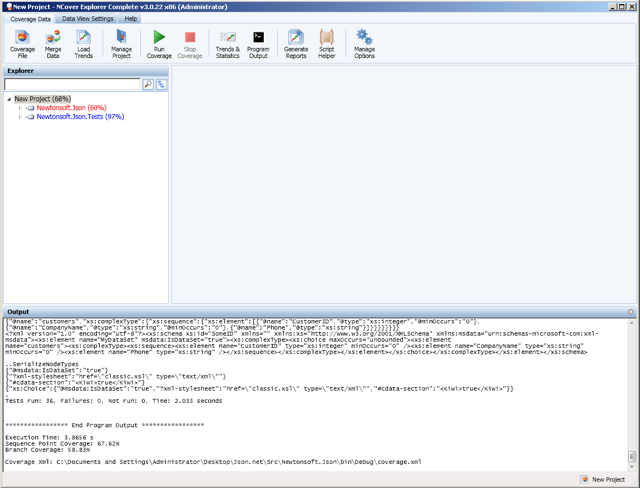 Open up a console window and cd into the location where you unzipped Json.NET. Next, cd into the Src\Newtonsoft.Json.Tests\bin\Debug folder, which is where your build output should be. Listing the files in the directory should reveal several DLL and PDB files, as well as a couple of xml documents. You'll see some output scroll by as the tests are being executed and should see that -- wait a minute! One of the tests failed. Let's go ahead and fix that before we continue. We can tell right off that the failure most likely happened because the developer of Json.NET coded the test against his time zone, rather than against whatever time zone the test is being run from, so a couple of changes around line 339 of the XmlNodeConverterTest.cs file should fix the issue. Now rebuild the project and run it through NUnit on the console again, and you should see that it completes successfully. Installing NCover should have added a shortcut to NCover Explorer in your Start Menu, so go ahead and open it up. Click on Manage Project, New Project in the toolbar to create a new project. You'll be presented with the NCover Project configuration dialog. Choose the nunit-console.exe executable in the NUnit\bin folder on your computer (it's usually installed in Program Files). In the working directory field, enter the path to the Src\Newtonsoft.Json.Tests\bin\Debug folder in the Json.NET project. In the application arguments field, enter the arguments for nunit-console. In our case this will be âNewtonsoft.Json.Tests.dllâ. Now click the close button in the bottom right corner of the dialog and click the Run button in the toolbar. You should see output begin to scroll in the output panel. The first few lines of the output show the NCover settings, and then you should notice the output of NUnit, just as it was displayed when we ran the NUnit tests before. Finally, you should see a summary of the coverage data and the return code from NUnit (which should be 0). Now that you've collected coverage data on the application, you'll notice that you can see the two project namespaces, Newtonsoft.Json and Newtonsoft.Json.Tests in the NCover Explorer tree view. You can also see percentages next to the namespaces. The percentages represent the percentage of lines of code in the namespaces that were visited during the execution of the tests. Expanding the Newtonsoft.Json namespace will reveal the namespaces within the namespace Expanding those namespaces will reveal classes, and expanding the classes will reveal methods. Clicking on a class or method will take us to the source file where the class or method is declared. You'll see within the source view that lines of code that were not visited during the course of the tests are highlighted in red, and lines that were visited are highlighted in green. We can tell fairly easily that the line will only be reached if a Json property doesn't return true from the ValidIdentifierChar method (which says that a property should begin with a letter, a digit, an underscore, or a dollar sign), or if it doesn't match a â or a â. So, let's write a quick test that creates just such an invalid property and attempts to parse it through a JsonReader. Our test should check that a JsonReaderException is thrown. The test basically just creates some Json with an invalid identifier (@CPU) and then reads the Json out with a JsonReader until it gets an exception. How do we know that the exception is thrown at the correct place, though? Well, build your project and go back to NCover Explorer. Open the Run dialog again, and hit the run button to run the tests through NCover.You should see that line 380 of JsonReader.cs is now covered, so we know that our changes caused that line to be visited and that the exception was thrown, since our test passed. We'll go ahead and improve the coverage for one more method in JsonReader before we wrap this article up. Let's focus our attention on a method that is completely uncovered. A little digging around in NCover Explorer reveals that the private method ParseComment (which starts on line 724) is completely uncovered. Letâs focus on that method. Run that through NCover Explorer, and you should see that most of the lines of ParseComment are now covered. It looks like we're on the right track. Now, let's get some of those uncovered conditions in the code covered. Run that change through NCover Explorer and you'll see that we only have one more line of code (line 757) in the method to cover and we'll be finished. I think that next line requires its own test. That line looks to be throwing an exception whenever someone has a forward slash in their code without a following asterisk, which basically means that they entered half of the start comment token. Run that through NCover Explorer and you'll see that it does in fact cover the last uncovered line of the method. In this article we saw just how easy it is to improve the quality of your NUnit tests using NCover Explorer. We can now feel confident that the ParseComment and ParseProperty methods in the JsonReader class have been thoroughly tested. A great exercise would be getting the JsonReader class to have 100% coverage. There's no better way to hone your skills as a programmer than going out and reading someone else's code, and even better, improving their code. Make it a habit to find some open source projects that you would like to be involved in and help them reach 100% coverage. By the time you improve a few classes in a project, you should see that you have a solid understanding of their project and that you are ready to add new features. Copyright (c) 2007 James Newton-King Permission is hereby granted, free of charge, to any person obtaining a copy of this software and associated documentation files (the "Software"), to deal in the Software without restriction, including without limitation the rights to use, copy, modify, merge, publish, distribute, sublicense, and/or sell copies of the Software, and to permit persons to whom the Software is furnished to do so, subject to the following conditions: The above copyright notice and this permission notice shall be included in all copies or substantial portions of the Software. THE SOFTWARE IS PROVIDED "AS IS", WITHOUT WARRANTY OF ANY KIND, EXPRESS OR IMPLIED, INCLUDING BUT NOT LIMITED TO THE WARRANTIES OF MERCHANTABILITY, FITNESS FOR A PARTICULAR PURPOSE AND NONINFRINGEMENT. IN NO EVENT SHALL THE AUTHORS OR COPYRIGHT HOLDERS BE LIABLE FOR ANY CLAIM, DAMAGES OR OTHER LIABILITY, WHETHER IN AN ACTION OF CONTRACT, TORT OR OTHERWISE, ARISING FROM, OUT OF OR IN CONNECTION WITH THE SOFTWARE OR THE USE OR OTHER DEALINGS IN THE SOFTWARE.